Police believe there are currently 33 organised crime gangs directly linked to paramilitary groups, amassing tens of millions of pounds each year. But despite the scale of activity, the Northern Ireland Courts Service confirmed that from 2007-15 there were just over 80 convictions secured under terrorism legislation, leading to 48 prison terms. Security services have said convictions are also secured under non-terrorism legislation, while they also regularly disrupt planned attacks. But today’s report includes criticism of government failure to tackle the scale of violence 20 years into the peace process, with evidence that groups retain huge numbers of members, with large amounts of weaponry still in circulation. Within weeks of the May 5 Assembly elections a government-appointed panel is scheduled to present recommendations on disbanding paramilitary groups. This comes as there is also a focus on the failure to provide policies to re-integrate the estimated 30-40,000 former paramilitary prisoners in Northern Ireland. But government and its agencies are reluctant to reveal data that allows full scrutiny of its performance in tackling paramilitaries. Among the first barriers to evaluating the scale of the problem is confirming the size of the various illegal groups. The Police Service of Northern Ireland (PSNI) told Detail Data it would not provide estimates. According to Rev Dr Gary Mason of Rethinking Conflict, an organisation that has worked closely with loyalist paramilitaries to deliver peaceful outcomes, loyalist paramilitary groups remain large. “At the heart of loyalist groups there would be a leadership of 30 to 40 people then a membership of several thousand,” he said. In 2005 MI5 took over lead role for national security intelligence work in Northern Ireland, with director general Andrew Parker stating in 2013 that the move had enabled the “vast majority” of dissident republican attacks to be “detected and disrupted”. Despite this, MI5 states that the threat continues to be severe in Northern Ireland and moderate in Britain. 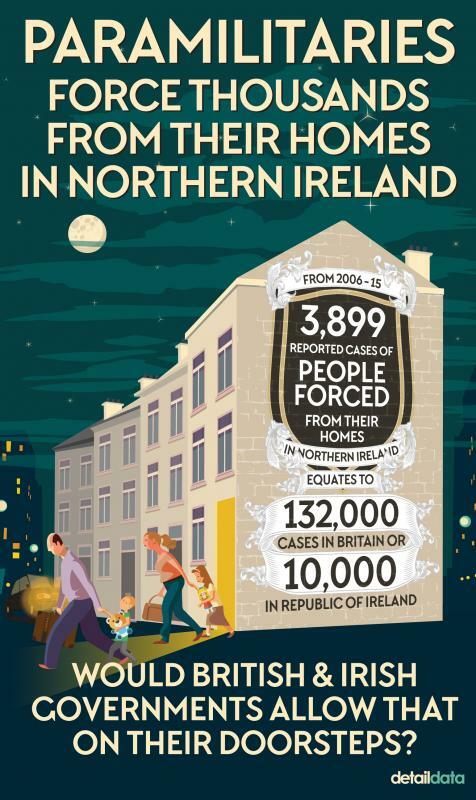 While some communities suffer higher levels of paramilitary activity than others, figures obtained by Detail Data also illustrate the scale of disruption across Northern Ireland. Data secured through Freedom of Information requests made to Translink and PSNI showed how security alerts and paramilitary attacks had forced road closures and stopped rail travel. From 2013-15 there were 193 road closures, while between 2006-15 there were 176 security alerts on rail lines, halting more than 4,000 train services. Click here to view the interactive graphic pictured below, where daily incidents are recorded. Given the scale of the wider paramilitary problem the Fresh Start Agreement, negotiated last year to stabilise the political process in Northern Ireland, appointed a three person panel to advise on the issue. The panel is scheduled to report in May, at a time when some experts in the field are arguing for a version of the United Nations endorsed concept of DDR (disarmament, demobilisation and reintegration). This could see existing barriers to employment, travel and insurance removed for many ex-prisoners, allowing them to re-integrate into society. Tom Roberts of EPIC, a group working with former prisoners from the loyalist UVF, said a working group from OFMDFM had produced a strategy to reintegrate ex-prisoners. He said the employment guidelines the working group proposed in 2007 (https://www.ofmdfmni.gov.uk/articles/news-conflict-transformation) failed as a result of political barriers. “If you don’t give people who were involved in the conflict the chance to avail of the services that are available to the general public then it makes it more difficult for these groups to civilianise,” he said. “The ex-prisoners’ working group which has been chaired by the successive heads of the civil service has been in operation since the Good Friday Agreement. And while the civil servants who service that group have been more than helpful in trying to address the issues, without the political will there has really been no movement on those issues.